Recent studies have discovered that certain kinds of rare honey have significantly higher antioxidant activity than other ordinary honey. This antioxidant honey is a powerful specially selected ultimate blend of pure, raw Buckwheat, Forest (honeydew), Manuka and select, uncommon multi-floral honeys from around the world which are known for their extraordinarily high levels of antioxidants and full spectrum phyto-nutrients that nature uniquely provides. 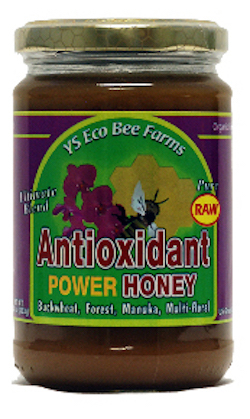 Enjoy the wellness benefits of Antioxidant Power Honey! Suggested use: Use as a functional food with full wellness benefits.